What's the best piece of FOB merch you own? A t-shirt? Hoodie? Maybe a meet and greet pic you put in a frame? 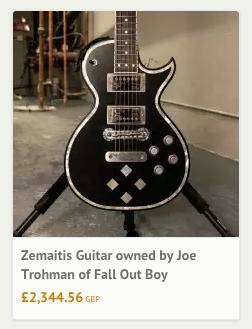 Well now you can own something even better - an actual guitar used by the band on tour! Oh yes, guitarist Joe Trohman has just put loads of his touring equipment up for sale online and you could be the proud owner of the greatest FOB merch around. 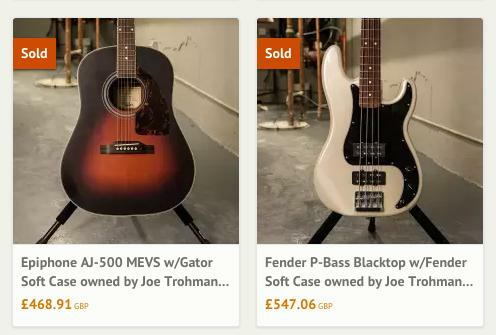 Joe has put around 40 items up for sale on Reverb, a musician's sales website, top bill items including acoustic and electric guitars, keyboard equipment, pedals and more. Sadly, some of the more desirable objects have already been snapped right up. ..but if you are quick you could still grab a lot of FOB-shaped goodies. A little pricey maybe but can you really put a price on happiness? Check out the full collection of items here.